Ok, a disclaimer before we get started: The Pu Pu Platter in a Chinese restaurant isn’t something you would find in a restaurant in China. And Singapore noodles are unknown in Singapore. My Singaporean friend was surprised when he noticed the item on a Chinese restaurant menu here in the United States, and couldn’t imagine where it was from. Where do Singapore Noodles Come From? So let’s dismiss any notion that Singapore noodles are an authentic Asian dish. Many take credit for the invention, but most think this noodle stir-fry was actually created at Chinese-American restaurants by Chinese immigrants, bringing in elements such as rice noodles from their country of origin. So what are Singapore Noodles? This dish—a popular Chinese take-out menu item—is a stir-fry made with rice noodles, lots of crisp vegetables, shrimp, strips of ham, and scrambled eggs. Curry powder is a seasoning, but lots of flavor also comes from a simple sauce of soy, rice vinegar, and Asian sesame oil. Whoever invented the dish is brilliant. You get crunch, heat, salt, sweet, smoke, and aromatics all at once. All the ingredients are added to the pan in stages, and from start to finish, it takes just over ten minutes. Like all stir-fries, this dish cooks very quickly, so it’s best to be completely prepared before you start. Peel shrimp, cut the ham into strips, and chop the vegetables. Cook the rice sticks and scramble a couple of eggs. Line up all the prepped ingredients so they’re right beside your pan, and you’re ready. 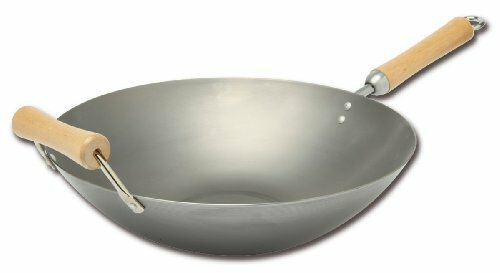 A large, well-seasoned wok is ideal, but lacking that, use a 12-inch skillet, which is what I use. Scramble the eggs in a separate nonstick pan if you think they’ll stick to your large skillet. Buy rice sticks, rice vermicelli noodles, or Mei Fun noodles for this dish. They come in 6- to 8-ounce packages. You need only 6 ounces. You can cook the noodles ahead and refrigerate them in an airtight container. Let them come to room temperature and break them up with your hands before adding to the pan. For the sweet onion, look for Vidalia, OSO Sweet, or Walla Walla. For the sweet onion, look for Vidalia, OSO Sweet, or Walla Walla. The super-sweet varieties are more suited to this stir-fry because at the end of cooking, the onion still has a slight crunch. 1 Make the sauce: In a bowl, combine the sesame oil, soy sauce, and rice vinegar. 2 Cook the rice noodles: Bring a large saucepan of water to a boil, add the noodles, and use tongs to turn them so they are submerged. Cook for 2 minutes, or until they are tender but still have some bite (they will cook a little more once you add them to the skillet). Drain, rinse with cold water, and use scissors to snip the noodles several times to break them up into shorter lengths. 3 Scramble the eggs: In a small bowl whisk together the eggs. Heat the skillet or Dutch oven over medium heat. Add 1 tablespoon of the peanut or canola oil. Add the eggs and scramble them for 2 minutes, or until they form large, soft curds. Transfer them from the pan to a plate or bowl. 4 Cook the vegetables: Add 1 tablespoon of the remaining oil to the pan. When it is hot, add the ginger, garlic, carrots, jalapeño, onion, and salt. Cook, stirring constantly, for 2 minutes or until the vegetables start to soften. 5 Add the remaining ingredients: Sprinkle the vegetable mixture with the remaining 1 tablespoon peanut or canola oil. When the oil is hot, add the ham, cabbage, scallions, red pepper, and curry powder to the pan. Cook, stirring constantly, for 1 minute. Add the shrimp and cook, stirring, for 3 more minutes or until the shrimp are bright pink and cooked through. 6 Add the noodles in batches: Add the eggs, the sauce mixture, and half the noodles to the pan. Toss for 1 minute. Add the remaining noodles and continue tossing for 1 minute more until they are thoroughly combined and the mixture is heated through. 7 Serve: Taste for seasoning and add more salt or soy sauce, if you like. Sprinkle with cilantro leaves and serve. Hello! All photos and content are copyright protected. Please do not use our photos without prior written permission. If you wish to republish this recipe, please rewrite the recipe in your own unique words and link back to Singapore Noodles with Shrimp on Simply Recipes. Thank you! Thank you. This was delicious. I added one additional teaspoon of sesame oil, added more curry powder (2 T total), and doubled the scallions; but other than that I followed the recipe to a T. Very tasty and we will definitely be having this again soon. I made this recipe yesterday and while it was an ok recipe, I think it would’ve been amazing with a few tweeks. The 6oz of noodles ended up making 7 large (2cup) servings which is much more than the quoted 4. The flavor of the veggie saute prior to the addition of noodles was wonderful and potent, but once the 6oz of noodles was added the flavor was diluted with only the barest taste of curry. Next time I would decrease the noodles to 4oz and add more curry powder (perhaps double!). I also substituted shredded rotisserie chicken for the shrimp due to some picky eaters. Overall, will make again with changes. Love, love, love this recipe! So much flavor, low calories, high protein what’s not to love. Lots of vegetables. No downside. I could eat it every day. Delicious!!! Do all the prep work, then it does take about 10 minutes to cook, Followed the recipe as is, My husband thought it was great! So the extra prep work was worth it! This is absolutely delicious, and my husband thinks it is even better than the local restaurant version. I changed it a little to make it low FODMAP and IBS-friendly. In place of the onion, I used the green parts of a couple of extra scallions and some chives. I used garlic oil rather than garlic. I love the taste of fish sauce, so I used that instead of soy sauce, and I also squeezed a lime over the dish. It is great with diced chicken thighs too. I have a feeling that this will become a frequent dish in our home. Thank you for a superb recipe! helpful, I will surely try at home. This definitely isn’t a dish that came from Singapore! It still tastes great though :) Thanks for the recipe.